We were so happy when we were kids. Why things couldn't stay that way? I want that carefree life back. I remember the day Chris and Beryl came to the orphanage like it was yesterday. Soon after their first visit Beryl came back for me and I have become part of the family. Later Chris told me it was him who had picked me, not his mom. She had actually asked him to choose. He could have picked any of the children in the orphanage and he had picked me, the cheeky red head. ​All my childhood we were best friends, we never fought. And I have loved him ever since. Then we started attending high school and everything changed. New people, new friends for both of us, but mostly for Chris, for I was perfectly fine with how things used to be, just me and Chris. He was always a good company and made me laugh a lot. He was everything one can hope for in a brother. And I was falling for him more and more and realizing day by day that I am not allowed to act on those feelings, because the world outside would not understand and people would consider it wrong and revolting if two teenagers living in the same family yet not blood related were romantically involved. And they would be right. But can you stop your heart from beating faster anytime the one you're in love with smiles at you over the breakfast every morning? No, you can't. And the more you know you shouldn't do/feel/want something, the more you desire it. I tried to convince myself to focus on anything else. I buried myself in books, I studied hard, did all the homework, even tried yoga to occupy my mind with anything but Chris. Didn't help. I got ahead at school and Chris started coming to me asking for help with his own homework. So much for trying to escape my thoughts of him with studying. Then Kristi came up with the idea of turning me into a beauty. When she mentioned I could become a prom queen, I quitted fighting my feelings and allowed myself to dream. I couldn't get the image of me as the prom queen with Chris by my side as my king from my head. I hadn't known until then how much I really wanted that. Dreams are dangerous as they are perfect. I have fought my feelings for so long, but to no avail. I loved Chris deeply and when I saw him in the arms Raven Nightshade something inside me snapped. I went with Kristi to the beauty salon because somewhere deep inside me there was a little spark of hope. Hope, that maybe when Chris sees my transformation he wouldn't look at me the same way as before. 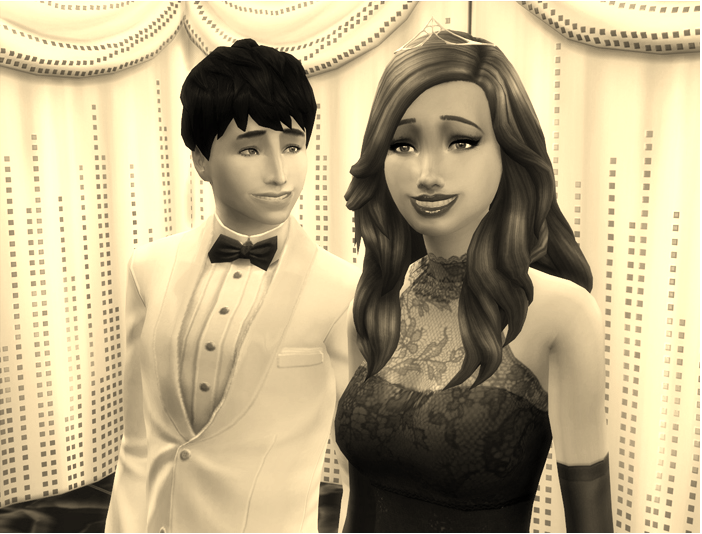 That he wouldn't see his adopted sister, but a pretty girl he would invite for a date, if she wasn't his sister. But I was wrong. Raven already sank her talons into him. I woud have never expected Chris to fall for a girl like her and her tricks. I knew he would meet someone sooner or later and fall in love. If it was Kristi or any other nice girl, I could probably live with that. But why did it have to be Raven? The one who least deserved him? Why did it have to be the mean and snobbish Raven, Chris? "I think I'm going to throw up," Kristi said loud enough to cause those two finally pull away from each other. ​Raven looked like a cat that just swallowed a helpless little bird. I wished I could wipe the smirk off her face. Chris finally noticed me and his jaw dropped. "Kellie?" he said taking in my appearance. "What's wrong?" he asked when he saw mine and Kristi's face. "She is!" Kristi blurted out motioning towards Raven. "How can you be with her of all people, Chris?" Chris folded his arms over his chest. "With all respect, Kristi, that's none of your business!" Raven smirked again. "Jealous much, Kristi?" "No," Kristi said bravely. 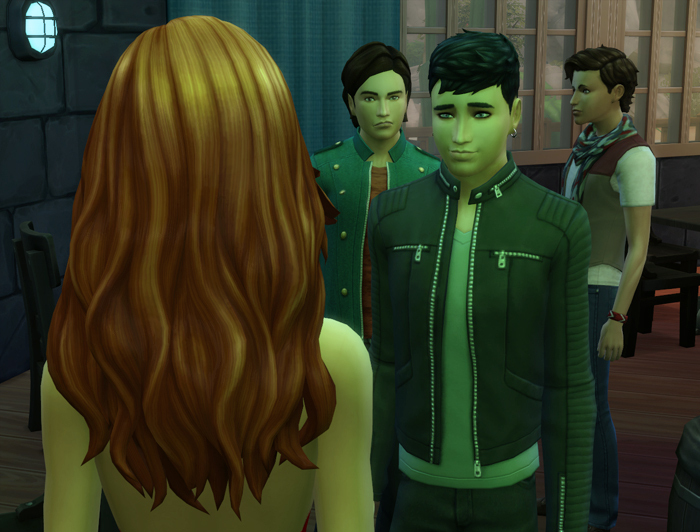 "I'm just terribly disappointed with my club leader who's fooling around with a girl who says awful things about his sister and my friend, and hangs around with boys who do the same!" Finally, that had an effect on Raven. Her smirk disappeared and I would swear I saw a flash of fear in her eyes. 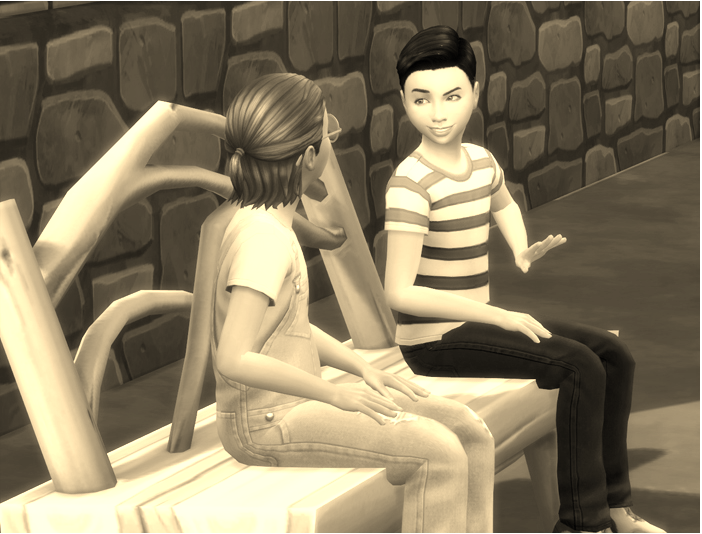 She had no idea somebody had heard her conversation with Thomas back then. Chris frowned and looked at me. "What things, Kellie?" I shook my head unable to speak over the lump in my throat. Kristi readily spoke in my stead, "She said that Kellie is so unclean that her brother shouldn't even touch her and that kind of stuff." Chris turned to Raven. "Is it truth? Did you say those things about Kellie?" Raven shrugged pretending she didn't care, but I noticed she was tense. "I say a lot of things. I don't remember," she said. Chris' frown deepened. "A lot of things about my sister? About me too perhaps? Or about my father like your friend Max?" Raven started talking fast. "Look at your sister, Chris. She doesn't look unclean to me now. What does it matter what I did or did not say then?" Chris looked at me again for a moment. Raven went on, "Hey, Kellie, Thomas is upstairs, I'm sure he'd be more than happy to keep you company and I don't mind, really. It won't take you much effort to get him where you want him, especially with your looks tonight. And I'm sure you'll find someone for Kristi there too." She shot a look at Chris who watched her disbelievingly. But Raven was far from finished. "Unless you came down here to impress your brother. But that would be gross, right, Kellie?" And that was the final straw. My vision turned red. Last thing I heard was Chris saying, "I think, that's enough, Raven." I raised my hand. My palm hit Raven's cheek with a satisfying smack. A moment of silence followed. I blinked several times to clear my vision and then I saw Chris holding his cheek. I hit him, not Raven! What have I done? I've never hurt my brother. Everything was ruined. I felt tears stinging in my eyes. There will never ever be a Cinderella moment for me, no matter what I put on. I wanted to disappear. I needed to get away from here. I needed to be alone. "I'm so sorry," I whispered and run away from all of them. I ran upstairs fast as I could and headed for the door when none other than Thomas Nightshade got in my way. "Hey, Kellie. What happened to you?" he asked when he saw the tears on my cheeks. "Nothing. Leave me alone, Thomas, please." "Doesn't look like nothing, kitten. Let me buy you a drink. A drink and my company will make you feel better, I promise." "I'm not in the mood. Just let me pass, please." Luckily for me, Parker Lum and Mathias Rosa were nearby and rushed to my help. "Is he bothering you, Kellie?" Parker asked. "Shall we teach him a lesson?" Mathias added enthusiastically and almost made me laugh for his slender figure would fit into Thomas twice. "No, he's just standing in my way." "So, what's it gonna be, Nightshade? Are you going to move or shall we force you?" Mathias threatened. Thomas smiled at me. "No need for violence in front of a lady," he said and stepped aside. Outside Chris caught up with me. His cheek was still red where I hit him. "I'm so sorry, Chris," I repeated. He gently put a hand on my shoulder. "Kellie," he said softly. "I'm not stupid. know you didn't want to hit me. I'm not mad at you." "You aren't? So we are okay again?" "Of course we are. Don't cry and give me a hug, you silly." Warmth was spreading from my stomach to my whole body. It felt so right to be in his arms. I didn't remember when we last hugged. Definitely not after he started working out, because his shoulders and chest felt much broader now. The scent of the soap he used tickled my nostrils. He started pulling away but I didn't want to let go. His cheek brushed against mine and I turned my head. Before I could stop myself I did what I always wanted to do - I pressed my lips on his. But Chris immediately pushed me away. "Ugh... What on Earth has got into you, Kellie? We are siblings for plum's sake! This was wrong in so many ways!" And just like that all my questions were answered. Chris never felt the same way about me and I just destroyed the precious friendship we had. What's got into me? Indeed. To make things worse Chris and I had an audience when I kissed him. 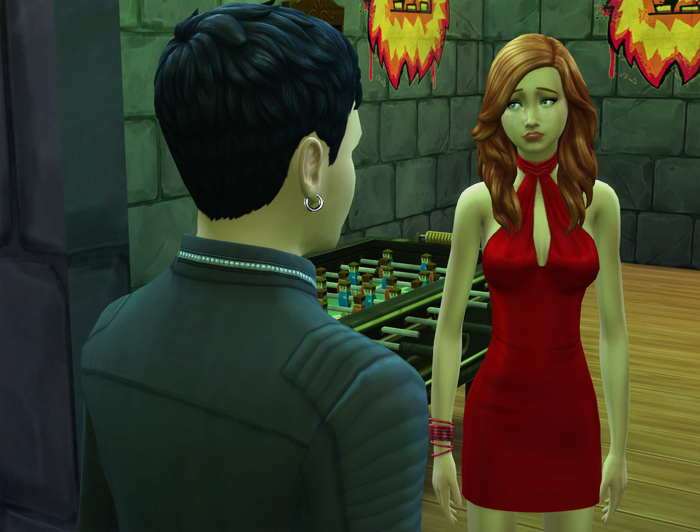 Kristi watched me with betrayed look and Raven... Raven was probably having fun of her life. My shame assumed monumental proportions. I started running again and this time I didn't stop. Not even when I heard Chris calling after me.